According to our research we can confirm you that Canon 100D features newly developed sensor, Canon 650D / T4i and 700D / T5i shares the same sensor. The EOS 100D sensor is a newly developed (2013) 18.0MP sensor with Hybrid CMOS II AF (80% coverage in live view) capabilities. The EOS 700D & EOS 650D share the same sensor (2012) and DiG!C5 image processing. This sensor is capable of Hybrid AF. 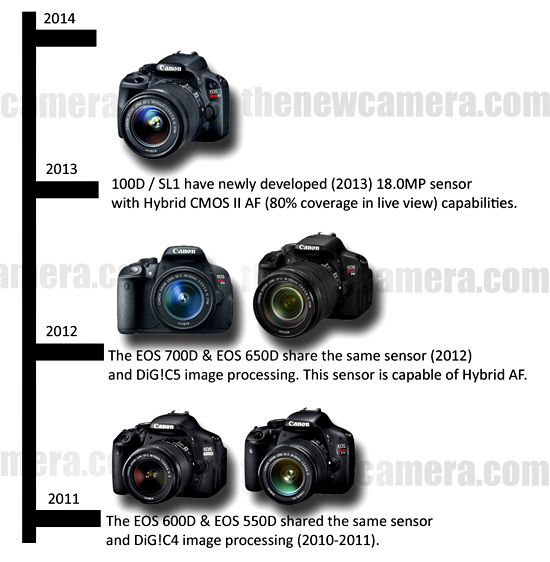 The EOS 600D & EOS 550D shared the same sensor and DiG!C4 image processing (2010-2011). Take a look at the comparison table and lets us know if you find any major difference…. Canon 700D announced on March 22,2013 and approx 9 Month older than Canon 650D, but on the specification side both look same. Verdict : Both camera features same type of core specification, We highly recommend you to buy Canon 650D, Also See Canon 650D Recommended Lenses. Take a look at the Specification review of Nikon D7100 vs Canon 650D and share your thoughts with us. Nikon D7100 is bit larger sensor and features more megapixel than Canon D650. Due to no optical low pass filter the Nikon D7100 will capture more details, color and have less noise at high ISO. Nikon D7100 and 650D features almost same ISO range, but Nikon D7100 can push its ISO to as low as 50, Canon is limited to 100. Nikon D7100 features better 51 point advance AF system with 15 cross type points, Canon 650D features Hybrid AF system with 9 points, All 9 points are cross-type, as opposed to only the central point in the 600D. The central point is also dual cross-type ( sensitive to diagonal lines) at f/2.8. Due to Phase AF points within the sensor, Canon Phase AF is also available during video recording, Nikon D7100 is limited to contrast AF during video recording. 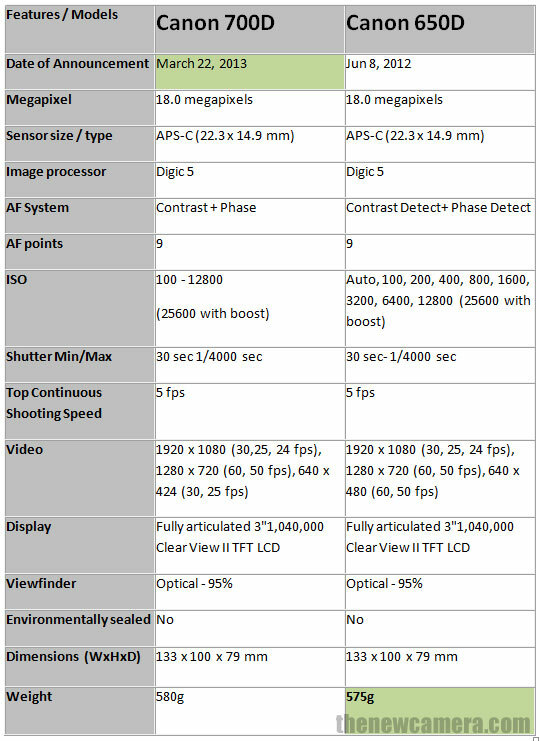 Nikon have better AF Detection Range, Compared to Canon 650D. Nikon D7100 features fast Continuous Shooting Speed compared to 650D in 1.3X crop mode (13.5 MP), in full resolution capture both have similar speed. you can capture full HD videos @ 60fps from Nikon D7100, AF is done by Contrast detect method during vide o recording. Canon 650D Full HD is limited to 30fps but you get Phase AF while recording videos. Nikon features fixed high resolution LCD display on the other hand Canon 650D is the first DSLR to feature vari-angle touch display with Touch and Shoot technology. Canon 650D feature in Camera HDR and multi-shot noise reduction capture, no such feature available in Nikon D7100. Canon 650D features better sensor , advance AF system and rugged body design – We highly recommend you buy Nikon D7100. Find out the Best Entry Level DSLR of 2013 – Nikon D5200 vs Nikon D5100 vs Nikon D3200 vs Canon 650D High ISO JPEG Test result published by focus-numerique, the Nikon D5100 features 16Mp APS-C sensor, Canon 650D features 18Mp Sensor, Nikon D5200 and Nikon D3200 both have 24 Mp APS-C sensor, according to latest news/rumors we know that D3200 sensor made by Sony and D5200 sensor is made by Toshiba. At ISO 3200 all the images have very less noise. Nikon D5100 images look bit underexposed throughout the test. From ISO 6400+ we can see green color bands in Canon 650D. 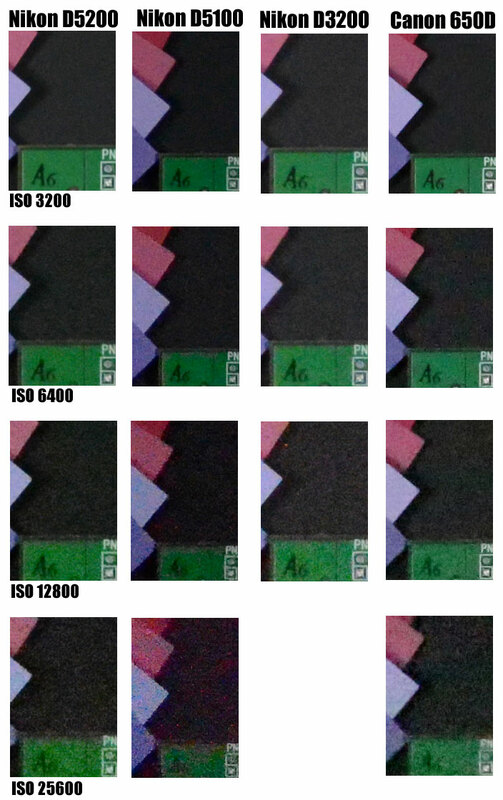 The Nikon D5200 have bit less color noise compared to Nikon D3200 @ 12800, before that images are almost identical. 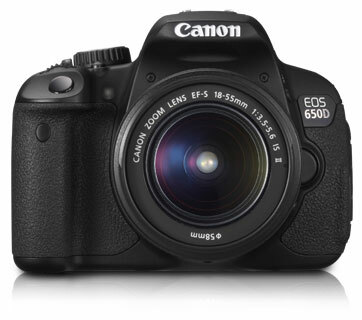 Many users asking the same question each day Which camera to buy, Canon 650D OR Nikon D5100 ? ., we will soon publish the specification comparison review very soon, before that take a look at images of taken from both the camera at different ISO settings. 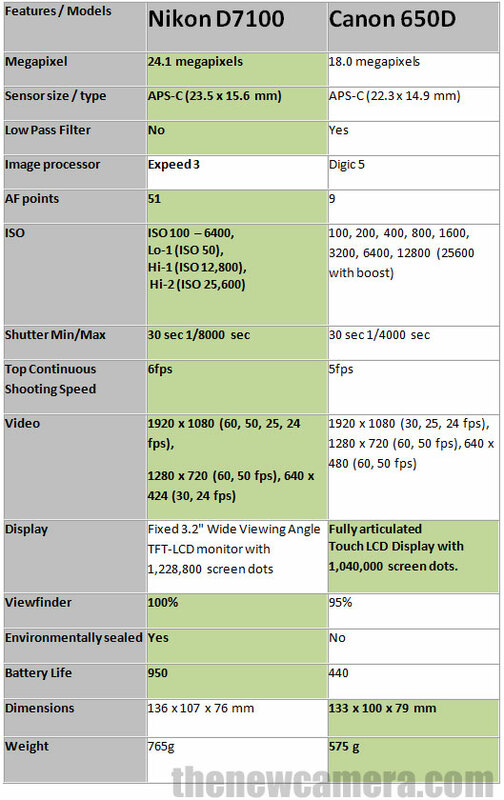 Nikon D5100 have bit bigger sensor (Canon APS-C -22.3 x 14.9 mm vs Nikon APS-C 23.5 x 15.6 mm) and Nikon D5100 have low resolution – 16.2 megapixels compared to Canon 650D with 18.7 megapixels. Shot settings: The Canon Rebel T4i / EOS 650D was fitted with the EF-S 18-135mm f3.5-5.6 IS STM kit lens and the Nikon D3200 was fitted with the Nikkor 18-55mm f3.5-5.6 VR kit lens. The third image show CA at edges but its not a problem of Canon 650D, the new 18-135mm STM kit lens suffers from chromatic aberration at the edge of the frame even at f8. …Overall, it’s clear that the T4i / 650D is a better camera than the D3200, but there’s a price to pay for those additional features and superior performance. Not everyone, particularly first time DSLR buyers need those features and the D3200 remains a compelling option as an affordable first DSLR. It’s also important to note the closer rival to the T4i / 650D will be Nikon’s long-awaited successor to the D5100, and I’ll update this page when that’s launched. High ISO test of Canon 600D published by FOCUS NUMERIQU, the noise of Canon 600D, Canon 650D and Nikon D3200 is very low / not visible at up to ISO 1600, so we have selected images after ISO 1600 to 12800. The brightness was set at 200 Lux during the test and the new canon 650D uses Canon 40mm STM lens. Noise is visible from ISO 1600 and lost in the detail begins at ISO3200. The color changes at ISO 3200 slightly, and the details become bit more less at ISO 6400. We can also see increased particle / color noise, noise can also be seen as not beautiful geometric patterns, at ISO 12800 Dynamic range is reduced, noise is greatly increased, detail is lost. A quantum leap is taken at ISO 1600 with a granulation becomes visible and more blunt for details, but the image remains a draw for great classic between A4 and A3. A cut above (3200), the grain is a little more visible and it just nibble the finest details. A new line has been crossed in 6400 with a slight color drift: the colors become pale and lose intensity. On flat colors, the grain becomes visible and provides a geometric structure unattractive. On the black background, it is possible to see purple veins.